The party, however, is short of the 137 needed for simple majority even. PTI leaders who have won more than one seat will also have to give up additional seats as the law allows an individual to retain only one. This means that the party will have to rely on independents as well as parties like the PML-Q, Balochistan Awami Party (BAP) and Grand Democratic Alliance (GDA) in addition to its natural ally, Sheikh Rashid, to be able to form the next government. There are also reports of a possible alliance with MQM-Pakistan (MQM-P). The PML-N, whose government completed its tenure in May, has this time won 64 seats, while the PPP is in third place with 43 seats to its name. Muttahida Majlis-i-Amal (MMA), an alliance of multiple religious parties, has managed to win only 12 seats, whereas MQM-P has garnered just six seats. PML-Q and the newly formed Balochistan Awami Party (BAP) have won four seats each, while the Sindh-based Grand Democratic Alliance (GDA) has scraped together two. Akhtar Mengal's resurgent Balochistan National Party (BNP) has bagged three berths for itself in the lower house of the parliament, while Awami National Party's (ANP) tally stands at just one. The Awami Muslim League (AML), Pakistan Tehreek-i-Insaniyat and Jamhoori Wattan Party (JWP) have also grabbed an NA seat each. Thirteen independent candidates have triumphed in their constituencies and are likely to play an important role in the formation of the federal government. Recounts on at least five NA seats, however, mean that the final result may differ from the count released by the commission today. Elections on two NA seats were also postponed by the ECP and will likely be held along with by-elections on seats vacated by leaders who have won more than one seats. PML-N, which has ruled Punjab for two consecutive tenures, has emerged as the largest party in the province again, winning 129 of the 295 provincial assembly seats on which elections were held on July 25. However, the party is not certain to form the government as the PTI is close behind with 123 seats and, with the help of independents (28), can bring its own chief minister. PML-Q has emerged as the third largest party in the province with seven seats while the PPP has won six. Jamshed Dasti's Pakistan Awami Raj has won a seat and so has the BAP. The PPP is in need of no coalition partners in Sindh Assembly to form the government as it has won 76 seats in the house of 130. The numbers have led the PPP Chairman Bilawal Bhutto-Zardari to announce Murad Ali Shah will again occupy the top slot in the province. PTI has edged past MQM-P in the province with 23 seats to the latter's 16, primarily on the back of its performance in Karachi. GDA, which had aimed to break the PPP's monopoly in the province, has won only 11 seats in the provincial assembly. Khadim Rizvi-led Tehreek-i-Labbaik Pakistan (TLP), which had entered electoral politics for the first time in general elections after rising to fame around last year's Faizabad dharna, has also grabbed two berths for itself in the province, while the MMA has managed only one. Interestingly, no independent candidate has won a seat in Sindh. PTI has surprised political observers with its performance in Khyber Pakhtunkhwa where it has won 66 seats of a total of 97 on which the elections were held. This is the first time in Pakistan's history that an incumbent party was returned to the Khyber Pakhtunkhwa Assembly. The MMA is a distant second with only 10 seats, while ANP's tally has been slashed to six. The PPP has won four seats in the provincial assembly while six independents have also won. The BAP has emerged as the largest party in Balochistan with 15 provincial assembly seats, with MMA in second place with nine. Who will eventually form the government in Balochistan is unclear as the BNP, BNP-Awami, Hazara Democratic Party (HDP) have won six, three and two seats respectively, while PTI has won four. Mahmood Khan Achakzai's Pakhtunkhwa Milli Awami Party (PkMAP) has managed a single seat, with its former ally, PML-N, also winning one. Shahzain Bugti's JWP has won a single seat while five independent candidates have also won seats in the province. The ECP had earlier attributed the delay in counting of ballot papers to a technical fault in the Result Transmission System (RTS) — a software used to relay results from presiding officers to the commission. 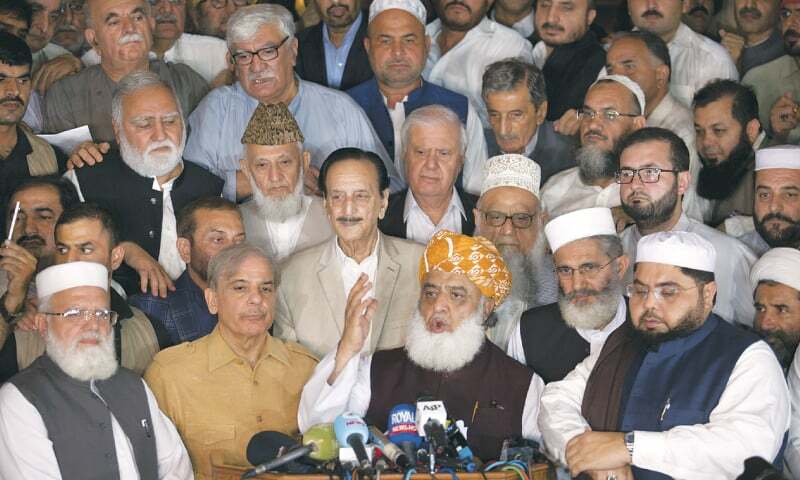 The counting process has faced severe criticism from almost all political parties with calls for recounts and then a demand for re-election by a multiparty conference yesterday, attended by the PML-N, MMA, PkMAP, ANP and others. However, the PML-N has made its demand for a re-election conditional on the decision of its central executive committee. 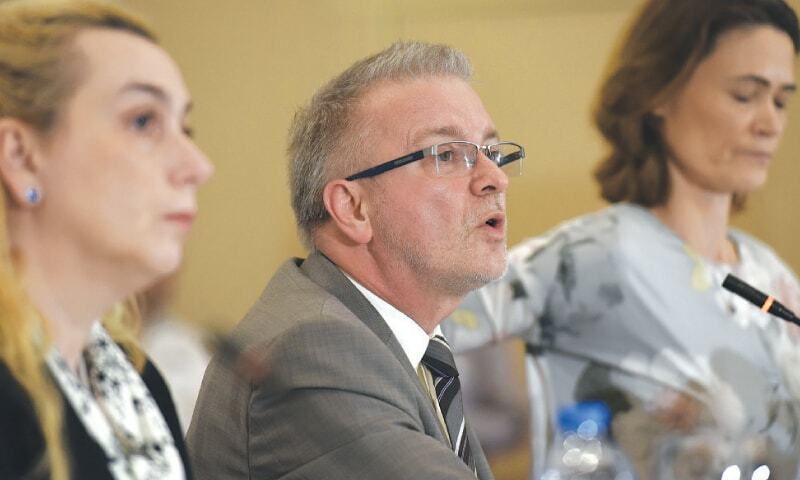 Foreign observers have also called for the commission to improve the process of counting ballot papers. Congratulations Pakistan! First step towards right direction for a prosperous and developed Pakistan. There is noting like permanent friends or foes in Politics. 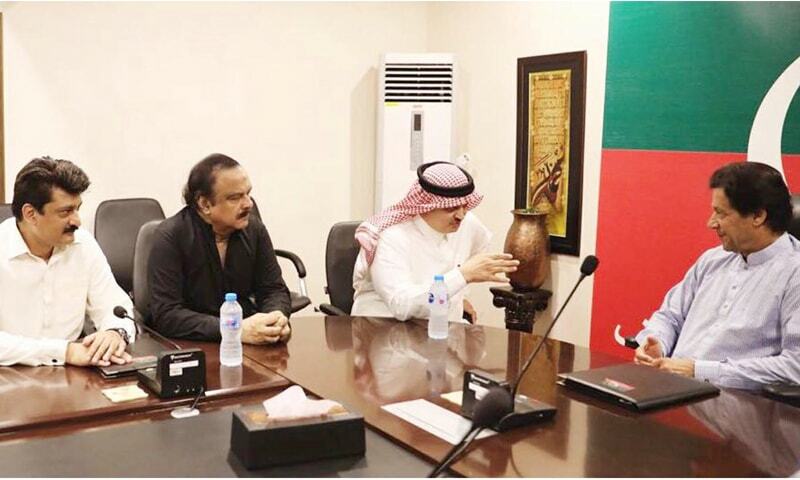 PTI must entice PPP before PML(N) joins to form a formidable coalition. Man of the Match and Man of the Series - Imran Khan. PTI needs to work harder and deliver. That is what we look forward to. I love you Pakistan my sacred Dharti Maa we will go to all lengths to protect you from both internal and external forces who can cause you harm. The elections in Pakistan held under a challenging environment, shows the courage of voters as they clearly embrace democracy. People do believe in the power of their vote to express a desire for change. The PM designate and other institutions in Pakistan must feel a sense of accountability and responsibility in delivering the change. Expectations run high and the world too looks on with interest. Good policies must be delivered with good governance to create an impact. This will be keenly watched. Pakistan will have the good wishes of all as it moves forward. Now the time is to perform.Pakistanis have given to those who they think will perform better and no corruption. PTI is leading,PML N leads where it has performed well like Lahore,Sialkot etc,PPP in interior Sindh as they have provided jobs as well as Waderashahi but in next election,there will be only one choice/ agenda and only that party will win who perform and is far from corruption. @Nomi Goraya PMLN has bagged seats from KP as well. Kindly recheck your stats. @M. Saeed How can IK take help from PPP as Mr. Clean IK has to put Zardari and his sister in prison for cases which were put by SC . These are cases that pu together will amount to billions as corrupt money. I congratulate people of Pakistan, who used their votes wisely and openly rejected corrupt mafia and their cronies. And, as a result, they have chosen PTI to form next government and sort out our current political and financial mess left behind by both PMLN and PPP parties during the last 10 years. Also praises goes to ECP, army and security personal who contributed towards carrying out fair and clean election. This is a win for democracy and rejection for corrupt mafia! Despite of such favourable conditions PTI could not get majority!!! The PTI-led government should implement nationwide reforms and checks to make sure strong-arm tactics using waderas, police, and local thugs are not used to 'win' seats, especially in rural areas. So please that at long last our country's founding father QMA Jinnah's vision of Pakistan will take root after 70 years of misrule in the country! PTI now must make sure that they put experienced and seasoned politician on the punjab CM slot. Pervez elahi has done well in the past. He should be our new CM punjab. Thanks ECP for batting well. Tabdeeli aagai! Now it's time for the nation to change. Naya Pakistan Zindabad! It is requested to all opposition parties to announce reelections on all 140 seats won by them. A great challenge for PTI to form government in alliance with it's like-minded partners at federal and provincial levels except KP province. Let's wait and see what happens next? Congratulations to Pakistani Awam. We are not concerned with results as we do not know the facts on ground. So we can not comment on it. What is good is that Pakistani Awam believes in democracy, that is how they came out to vote. Took far too long for ECP. Makes you wonder what was being done behind the scenes. @M. Saeed Imran khan has said many times that if he is unable to form a govt, he will rather sit in the opposition , rather than joining with another known corrupt party. @NY which proves establishment was not involved. otherwise, PTI would have won with a simple majority & no need to struggle to win over independents & other allies. @dawn, it is 116 for PTI. Good job done by people of Pakistan as they got rid off some free loaders sitting in assemblies for more than half century. All parties must unite against this unfair result - it was Selection NOT Election. Congratulations to Imran Khan and PTI. I have never been a PTI supporter but I am hoping and praying that Imran Khan becomes the first Pakistani Prime Minister to complete a five-year term. Good Luck. PML-Q should give up. For name sake, they do not join other party. There is no ideology or conviction on part of Members. How PTI will prove majority for formation of government? Did you see the reverse swing? Imran Khan has to find a group of good, experienced and seasoned candidates for minister's jobs. A very disappointing selection so far has been of the finance ministry. Asad Umar may be a good party worker but a finance minister requires more than a chemical factory business analyst experienced man. Talk to old CSP officers and ask for help and stay away from bad ones. There are a lot of decent Pakistani who will help you even free. Try it and you will like it. I am totally surprised that despite having poor performance over last 30 years and corruption, PPP actually did better than last time. A failure for PTI that they did not make inroads into their stronghold. This is the great achievement of imran khan, finally his struggle has successfully accomplished. This is just the tip of the iceberg. Let's wait and see what happens next? Good to see the corrupt mafia were not able to take over & loot whatever is left of the country. A new beginning, a lot to be done. Slowly & steadily we expect to see the recovery. I tell you it will not be easy. Pray for good governance. Very minutely planned and executed elections. All major political parties under firm control with their numbers in hand. Leaders can neither laugh nor weep can only curse. Congrats to all. Change for the better is imminent inshallah. This is the turn for Imran Khan and he deserves to rule Pakistan for bringing to the right track. All losers who make hue and cry in fact know what they did to their people. Salute to people of Pakistan who gave a very positive reply to the traditional so-called politicians. At least 35-40 of these 115 PTI seats are through open and blatant cheating/rigging. Looks total rigged election, especially in Sindh. As a impartial observer I in my wildest dreams never thought PTI would have won and grabbed many seat as they have. Why? Because of these soldout media .....and corrupt biased, bribed media. This is a wakeup call for many and myself. I think Naya Pakistan should take these corrupt to task. Finally, PTI has evolved to manage Premiership of the country in the kingship of Imran Khan despite of reservations and rigging allegations by all major parties contesting General Election 2018. Being a responsible nation, we all should openly accept the results and let the ruling party do its due role with 100% commitments, confidence and trust to bring real prosperity and rule of law in the country. We need to behave like a strong and united nation as we believe we are by standing tall with the government. We wish prosperous future ahead. With good players and umpires in your side, no one can defeat you. Now field is yours? The people have spoken and put trust in Imran Khan...now Imran Khan has to reciprocate the peoples trust by appointing "CLEAN' people to serve people! @Nizamuddin Ahmad Aali Seems like either you are joking or did not get the opportunity to gather more info or have not seen him in any discussion. Asad Umar might be the best PTI logical head and competent professional that PTI has got. The largest democratic election takes place in our neighboring country India. India is much more established and prepared to go through their mega size election process and even they announce the results of their upper house, lower house and Lok Sabha after 3 days. At times within 3 days to 5 days. So considering that we are 1/5th of Indian, our election comission has done a fairly good job in assembling all the information from the elections and announce after two days. Good job election commission. I really respect Saraj ul Haq. I wish he stays away from the rest of the crooks. @Ayesha your last sentence sums it all. @Imtiaz Ali Khan = Your sentiments are ver touching! I wish more of us show the same spirit. Is that what Bhutto said many years ago?